Here's another post about all the things that go into getting a book ready for publication, things that must be done many, many months in advance. What do you look for in a book? Does a cover influence you? Here's an excellent post about book covers and some of the factors that go into their design. 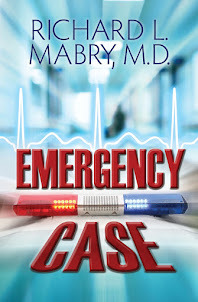 For my forthcoming novel of medical suspense, Code Blue, it took five passes with the design team before my editor and publisher were happy with the result. I think they did a good job. Hope you agree. For those unfamiliar with the process, a query letter (now most often sent via email) is a short communication to an agent from a writer requesting representation. In the unusual circumstance that the writer is able to approach an editor directly, the first step is also a query. If things go well from there, subsequent submissions are a proposal and/or a "partial" (much more detailed than a query, plus a sample of writing), then a "full" (the entire manuscript). 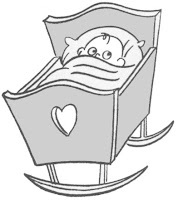 Writers may refer to queries by other names, generally unprintable in a family venue. In other words, writing one is associated with a great deal of angst ("Did I get it right? Will they like it?"). There are two posts today that give very good examples and suggestions on writing queries. Whether you're struggling with writing a query or just curious about the workings of the publishing industry, I highly recommend to you the posts on Writer Unboxed by author Therese Walsh and CBA Rants and Ramblings by agent Rachelle Gardner. I’ve been taking advantage of Thomas Nelson’s offer to receive copies of some of their books in return for posting a review on my blog. The most recent book I’ve requested is The Noticer, by Andy Andrews, and I have to say that this one is different—and in a good way. The Noticer is part fiction, part allegory, part self-help book. When I read the cover blurb by pro golfer Nancy Lopez that this was the “best book she’d ever read,” I was a bit skeptical. Then I started reading, and was soon convinced of the truth of that statement. The book follows the influence exerted by a mysterious stranger named Jones—“Just Jones, no Mister”—on the inhabitants of a mythical southern coastal town. Through encounters with a variety of people struggling with a myriad of problems, Jones gives a new perspective, one that offers hope and help to those of us who’ve faced those problems or some like them. One thought, repeated several times in the book, particularly resonated with me. Here’s a paraphrase. “Crisis? Everyone on this planet is coming from a crisis, struggling through a crisis, or about to enter a crisis.” In other words, what you’re experiencing right now may seem to be the worst thing that could possibly happen to you, and you may think you’re the only one going through those trials, but that’s not true. It’s life. And it will get better. I intend to buy several copies of this book and give them to friends and family. As for my own copy, I’m about to go through it a second time with a yellow highlighter. Because, goodness knows, there are lots of times I’d benefit from a new perspective. Thanks for all your prayers and good wishes. 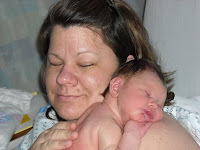 Mother and daughter are doing well, proud father is still walking on air, and grandparents are exhausted but happy. I promise, I'll get back to writing-related posts on Monday (I already have one ready), but for now--it's time to enjoy this new addition to our family. I'm guest blogging today at "CBA Rants and Ramblings," the blog of my super-agent, Rachelle Gardner of WordServe Literary. I hope you'll check out why I say that "no mile along the journey is wasted." 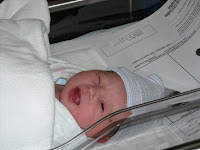 Back here soon with details about the new grandchild. 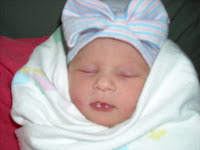 Cassidy Ann (Cassie) Kirkham arrived at 10 PM tonight, weighing in at 6# 13 oz. Ann is doing fine, although exhausted. Benny is walking on air. Cassie is hungry and wondering what all the fuss is about. Pictures later. Thanks to all of you for your prayers and good wishes. I'll be away from the computer today. Kay and I will be with daughter Ann and son-in-law Benny for their blessed event. Details to follow. Talk among yourselves until I'm back. Thanks. I don't do many book reviews on this site. I've sometimes mentioned books on writing that I've found particularly helpful (which reminds me that I need to post that complete list again soon). There are occasions when I've read something that elicits a comment and recommendation from me. And more recently I've taken advantage of the offer from a particular publisher to receive books from a limited list of choices in exchange for agreeing to post a review on my blog and a web site such as Amazon. Usually these are books I'd enjoy reading anyway, so I figured the trade-off was worth it, especially since the publisher assures those of us in the program that they want our honest review. I recently signed up to review a particular book that sounded interesting. I found it to be fascinating and worthy of my recommendation. I was all set to post my review when I noticed the fine print in the offer. All reviews were to be posted on such-and-such a date. I checked on this by email and was told that yes, there was an embargo on my post until the date when all the reviews were to go out. I suppose this is just another marketing tool, a way to create instant buzz and maybe get this book to the top of some list or other. But it felt funny to me to be told I couldn't post my recommendation until some arbitrary time. Advance reader copies of books go out all the time, hoping for blurbs to be used on back covers and in advertising. Influencer copies are sent to a number of people designated by the author and publisher in an effort to create positive buzz. I suppose there's no difference between these actions and sending out review copies with a request that all reviews be posted on one day to create a barrage of publicity. What do you think? To Market, To Market: What About Book Trailers? I mentioned previously that I'd have more to say about all the things that an author has to do prior to (and after) publication of his/her novel. One of the big things getting a lot of attention currently is a book trailer. Actually, the term "book trailer" is copyright Circle of Seven Productions, and I'll refer you to their site for details about it. I had to do a bit of searching for a book trailer example, but here's one for my friend BJ Hoff's novel, Song of Erin. Kelli Standish has done a great job on it. My fellow authors in the Abingdon fiction line are working to develop trailers for their forthcoming books. Thank goodness, I have a few more months before I have to start thinking about that. 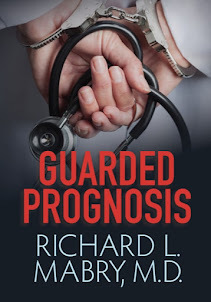 Right now, my time is split between writing novel number three in the Prescription For Trouble series (number two has gone out already) and worrying about what I can do to help market Code Blue when it comes out early next year. And, of course, life goes on in between my times at the computer. What do you think about book videos? Do they help you? Do you ever watch them? Let me know. And do sign up for my email list. I promise, there'll be a newsletter eventually. In my previous post, I encouraged you to click on this link (YouTube has asked that the video not be embedded, although I'm seeing some people violating that request) and hear Susan Boyle's beautiful rendition of "I Dreamed A Dream" on Britain's Got Talent. I'm not ashamed to say that I had tears in my eyes when the song ended, not just from her voice--although it's beautiful--but from the way the story played out. 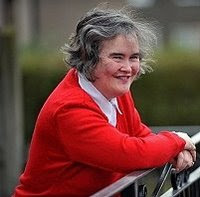 Susan Boyle is an unmarried, unemployed 48-year-old Scottish woman who cared for her mother until the woman died at the age of 91. Susan began singing in the church she attended every Sunday. Her mother encouraged her to sing, but Susan stopped two years ago when her mother died. Because of a learning disability stemming from oxygen deprivation at birth, she'd been ridiculed much of her life. Her TV appearance started out to be another such experience. Then she started to sing, and the sarcastic grins on the faces of the judges changed to open-mouthed amazement. Despite her appearance, despite their preconception of her, this woman was talented. Lessons? Oh, you can draw dozens from the story of Susan Boyle. Write your own parable if you wish. For those of us who write, who struggle on wondering if our efforts will ever pay dividends, uncertain whether our sweat equity in the craft will ever be rewarded, this is just another success story that gives us a glimmer of hope. If there's true talent and if that's combined with a will to succeed, there's always a chance. And that's what keeps us going. There's always a chance. I don't watch reality shows. I've seen part of one episode of American Idol. But someone--can't recall who, but I'm indebted to them--suggested I view this clip. I hope you'll turn up your speakers and watch this brief snippet from the British version of Idol. It's worth your time. There are lots of things I want to say about it, but at this point I'll let it speak for itself. I've just finished an excellent book. I'll be posting a review in a couple of weeks (delaying at the request of the publisher), and I'll have more to say about it then. Today, though, I want to pull a thought out of the book and examine it. One of the statements made by a major character goes something like this: "You may ask why this happened to you. Why are you here? I maintain that you're exactly where you're supposed to be at this moment in time." At first this seemed like nonsense, but as I examined my life I could see situations where God had placed me in particular situations--situations I might not have chosen for myself--and given me the opportunity to be useful in one way or another. I just recently had occasion to go through some of my journal entries written after the death of my first wife. One of my constant questions at that time was why she was taken and I was left behind. I still don't have the full answer, but I came to believe that if I had been given another day, or ten, or a hundred, or a thousand, it was a pretty good indication that God had something more for me to do. So I began to open myself to that possibility. In my case, the "something more to do" has turned into a lot of things: writing, speaking, being there in family situations, serving in a new church, encouraging friends. Tomorrow, try saying to yourself, "This is exactly the place God wants me today. I wonder why?" "In the end of the sabbath, as it began to dawn toward the first day of the week, came Mary Magdalene and the other Mary to see the sepulchre. And, behold, there was a great earthquake: for the angel of the Lord descended from heaven, and came and rolled back the stone from the door, and sat upon it. His countenance was like lightning, and his raiment white as snow: And for fear of him the keepers did shake, and became as dead men. 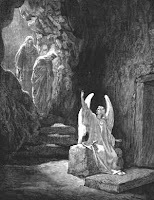 And the angel answered and said unto the women, Fear not ye: for I know that ye seek Jesus, which was crucified. He is not here: for he is risen, as he said. Come, see the place where the Lord lay. It's Good Friday, the day on which we commemorate Jesus' sacrificial death. For the disciples, it seemed that their hopes were sealed behind the stone that was rolled across the mouth of Jesus' tomb. But there was more to come. I was privileged to have this meditation that I wrote appear in Upper Room Devotional Guide on Good Friday last year. I hope it speaks to you and reminds you that the events of this day don't mark an end, but rather a beginning. Blessings. I promised to tell you a bit about what happens after signing a contract to have a book published. First, though, let me tell you that the actual signing of a contract may come a month or two after you get that phone call telling you that a publisher wants to buy your book. That time is taken up with negotiating all sorts of things: advances and royalties, deadline for manuscript completion (if it's non-fiction) or editing (if it's a finished novel), author's copies, foreign rights, and the list goes on. And during those weeks, you really can't tell people you've signed a contract...because you haven't. You may think you're engaged, but you don't have the ring yet, and certainly nothing has been done that can't be undone in the twinkling of an eye. Only when the contract is signed do you move on to the next phase, which includes calling or emailing everyone you know to tell them the good news. First, there's the matter of a cover. Publishers vary in the amount of input they want from an author in the final choice of a cover, but the art department needs to know the major plot points, the physical characteristics of the lead characters, and other information that helps them put together cover art. You can't have a blue-eyed blonde heroine on the cover and a dark-eyed brunette described in chapter one. Who gives them this information? You, dear author. Then there's back-cover matter. That's the "tease" that will hopefully get the potential reader to pick up the book and flip through it. And again, writing that is your job. You probably did much of this when preparing your proposal, but it has to be polished until it shines before it makes the back cover of the book. And while you're at it, put your modesty aside and write a five- or six-line author bio for the back cover as well. (This may go on the end-flap of the dust jacket if it's a hard-cover book). Oh, and you'll need a picture. A good one, definitely high-definition and in a jpg or gif file format. Don't have a good photo to use? You may need the services of a professional photographer. Who do you think writes those nice reviews on the book store sites? The early ones are written by folks called "influencers" who read advance copies of the book (called ARC's or advance readers' copies) and--if they like it--tell others about it via their blogs, websites, reviews, and word-of-mouth. And the list of those people? It doesn't just materialize, and although your publisher can help, you're expected to play a large part in compiling that list. Hope you were thinking about it all along. And don't forget endorsers, the people who give you snippets of praise--again, if they like the book--that find their way onto back covers, ads, and bookmarks. You'll need to line these folks up, as well. One of my favorite scenes from The Muppet Movie was when Orson Wells gives the order for the Muppets to be signed to "the standard rich and famous contract." I didn't expect to become either rich or famous when I began writing, and it's a good thing. Writers write, by and large, because they feel called to do it. But writing doesn't do much for anyone except the author unless someone reads what's been written. And, believe it or not, even after the signing of the contract, there's a lot more work to be done by the author before anyone who's not being paid to do so reads those words. There's more, but I think that's enough for now. Again, note that you can click on the tab on the right side of this page and enter your email address to be put on the extremely confidential, top-secret, never-spammed list of people who'll receive my newsletters in the future. Oh, and if you encounter any problems, let me know. Running a website and a blog is another thing an author is expected to do. After a number of false starts, several muttered imprecations, one call to customer support, and some advice about HTML language from my wife, I've completed the revamp of my blog site. I'm not yet satisfied with the particular template and color (I just changed that, and I think I'll keep this one), but I had to "upgrade" to a newer version of Blogger in order to add some features a few of my loyal followers had been strongly suggesting I include. Now, you may notice, you can sign up to get this blog on a variety of RSS feeds (and I'm not sure I fully understand how that works, but it does) and can even leave your email address so I can send you what I'm hoping will be an occasional newsletter with announcements, writing tips, and maybe even an offer of a freebie or two. Now we'll see if it's all been worth it. The question has come up as to whether a website is even necessary if there's already a blog. Oh, the conventional wisdom remains that "every writer should have a website." I have one--it's been up for years, and we've updated it a few times--but most of my time is spent on this blog. Kay is working on the last few tweaks to completely revamp the website, but life and other obligations continue to slow that project down. I think the blog and website accomplish two different things. The website gives you a bit more in-depth information about the owner and (if he's an author) his books and speaking. The blog is more personal and changes more frequently. My plan is to continue both, but I'd be interested to hear your take on the subject. As for what you'll get if you leave your email address in the space provided in the sidebar, let me assure you that what you won't get is spam. That part of the site is managed by a company that sends me the list but promises solemnly that the addresses will never be shared with anyone else, and other users have been happy with their performance. For now, feeling as though I've tangled with this monster long enough, I plan to sit back and stop tinkering. Let me know if you think my efforts were worth it. This afternoon, the fields that border the highways in this part of Texas will be crowded with families. They'll be bringing their kids, dressed in their Sunday finery, to take their pictures against a background of bluebonnets. 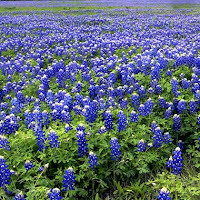 The bluebonnet is the state flower of Texas, and the sight of acre upon acre of the blue blooms resting amid a sea of green leaves always makes me glad to live here. Our spring weather is unpredictable. Eighty degrees yesterday, fifty today, with winds and possible showers and who knows what else as the week progresses. But one thing is certain about spring in Texas. The crop may be meager or magnificent, but there'll be bluebonnets. And families having their pictures taken amidst them. When a writer, especially one who's not yet published, hears the word "platform," this is probably the picture that pops into their mind. The prospect of building a platform--something that will get their name and product into the public eye and mind--is anathema, to say the least. The process isn't easy. It's daunting and time-consuming, but it's do-able. I began building my platform several years ago, just about the time my non-fiction book, The Tender Scar: Life After The Death Of A Spouse, was published. 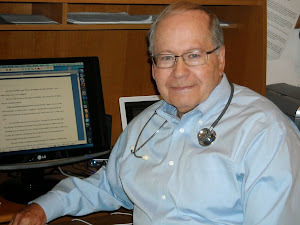 Even then, I was hearing the advice, "Every author needs a web site." I had no idea how to go about the process, but a bit of Internet research allowed me to find a domain name that seemed appropriate, and I grabbed it, tying it up for three years and making a note in my Palm Pilot to be sure to renew it then so I didn't lose it. Now I had a site but nothing on it. My wife, Kay, decided to play with the process, we purchased the requisite software (which wasn't too expensive), and between the two of us managed to put together a pretty good site. Let me interject here that there are some excellent website designers, and the costs involved can be modest. I won't mention any particular one, but I see recommendations on various writing loops frequently. I'd suggest you check a number of websites, find one you like, and contact the owner to see who designed it. Right now, Kay is redesigning my website to include more about my fiction writing and forthcoming novel, so stay tuned for more on that soon. At that time, the focus of my website was my writing and speaking on grief and loss. To further build platform, I began making contacts that allowed me to speak to groups about grief and loss. These engagements allowed me to minister through what I said, but also let me mention my book, which many of the attendees bought. To further extend my platform, I wrote some short pieces and submitted them to various publications. Some were rejected, some accepted and printed, but this not only let me get my name out to the readers, it gave me a foot in the door with editors of the periodicals. As a result, I was able to query them about some freelance pieces, and when these were published... Well, you see how this snowballs. About that time, everyone was starting to blog. I hate that word. Sounds like something out of a 60's sci-fi movie. But weblogs seemed to be the wave of the future, so I started Random Jottings. I have a small but loyal following (and thanks for that), and the blog not only lets me encourage other writers and entertain readers, it gets my name in front of people. So, when Code Blue launches next year, I hope there'll be a few hundred folks who recognize the name and ask, "Wonder if he writes fiction as well as he blogs?" Hope so, at least. Then came social networking. You can follow me on Twitter or Facebook, although I don't spend a lot of time on those. I use Twitter to follow a few friends, and although I accept Facebook friends who seem to have some connection with me, however distant, I follow a limited number of persons. But the result is...all together now. It gets my name out there. One thing I haven't done yet, and this makes me feel guilty, is collect email addresses and start sending out a newsletter on a regular basis. Right now, I'm too technologically challenged to do it easily, but that's next on my list, along with making this blog available via FeedBlitz or some similar site. Meanwhile, if you haven't done so, use Google Reader to let you know when new posts appear. There's more to the story, but this gives you an idea about the first steps to building a platform. If you're a writer, you need one. And not for the purpose associated with the picture above. Now, to paraphrase what's going to be said at the Texas Motor Speedway this weekend: "Writers, start your platforms.